Criminal justice schools in Oregon prepare students for officer training programs, legal careers and law enforcement positions available throughout the state. Oregon is home to thousands of acres of natural territory, so there is a demand for wildlife and environmental peace officers, as well as patrol officers and law enforcement officials responsible for keeping the peace among Oregon’s counties. 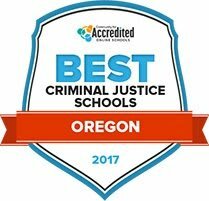 This page provides details about educational requirements and career paths for some of the most attractive criminal justice jobs in Oregon. After Criminal Justice School in Oregon: What's Next? Finding criminal justice schools in Oregon that offer career support, a variety of degree options and training opportunities for jobs in the legal and protective services field may be difficult. Review the rankings below to narrow your search process and compare schools by tuition, acceptance rates, enrollment and other key factors. Training objectives at the Chemeketa Community College associate of applied science in criminal justice program are to prepare adults to understand arrests policies and procedures, policing ethics, criminal law and juvenile justice. Associate's degrees are available in law enforcement or police and corrections. Chemeketa Community College also confers certificates in basic law enforcement, basic corrections and juvenile corrections. It takes about a year to earn a certificate. Students who want to transfer into four-year criminal justice degree programs at other accredited schools should pursue the college's transfer degree tracks. Classes are taught at the school's Brooks training academy. Textbook training is blended with hands on training at the academy. The Human Services Department administers the Associate of Applied Science in Criminal Justice degree at Clackamas Community College. Operating on an open enrollment policy, the program covers routine patrols, criminal investigations, criminal justice theories and the history of law enforcement in America. As many as 90 credits are needed to graduate. Nearly 20 of the credits can come from criminal justice electives. Graduates of Clackamas Community College's criminal justice program can receive ongoing support through organizations like the Criminal Justice Society. Ongoing support is also available through the school's alumni associations. Early courses in the Klamath Community College criminal justice associate's degree provide adults with a general introduction to law enforcement, policy and corrections. Later in the curriculum, adults learn how to mitigate crisis situations, create detailed law enforcement reports and how to understand and serve diverse populations. High school students interested in pursuing the major are encouraged to perform well in math, social sciences and writing. More than 60 credits are built into the Associate of Applied Science in Criminal Justice degree. Full-time students could earn a one year certificate in criminal justice then transfer into the degree program. Core curriculum in the Associate of Applied Science in Criminal Justice 90 credit program at Treasure Valley Community College focuses on key areas like criminal law, policing, investigative procedures and ethics. It takes two years to finish the program if attending school full-time. Graduation requirements also state that students earn a 2.0 GPA or higher. Learning outcomes cover community relations, ethics, patrol procedures, law and criminal investigation. With work based learning, students could complete the program sooner. A background check is required to earn credits through the Cooperative Work Experience option. Although there are law classes in the Central Oregon Community College criminal justice two-degree program, the degree is mainly designed for adults who want to work in law enforcement or corrections. Instructors teach classes in subjects such as criminal justice system surveying, criminology, corrections, children at risk and small group communications. A minimum of 93 passing credits meets the school's requirements to earn the Associate of Applied Science in Criminal Justice degree. New students need a high school diploma or GED to get accepted into the program. The criminal justice program at Portland State University allows students a full understanding of criminal activity at levels like cause, consequences and prevention. Students are led into producing policy research through the program. Graduates go on to work at local, state and federal law enforcement levels. They also work in probation, corrections, social services and go on to law and graduate schools. The program has many relationships with agencies where they can place students for internships. The degree can be completed online or through a campus program. Students in the Western Oregon University criminal justice program study topics like criminal law, police and community, corrections and criminology. Students also take courses in political science, social science and other humanities, along with general education courses like mathematics. Within the major, students can select from a number of areas of concentration. Near the end of the program, there is also an unpaid practicum experience, in which students work a certain amount of hours in a criminal justice agency. The practicum takes place in the last spring or summer terms. At Concordia University, students can take the criminal justice program online or in person. They can even mix and match online and in-person program requirements to create a program that uniquely works for them. Courses are offered both in the daytime and evening. Graduates of the program go on to work in law enforcement, corrections, security, intelligence, parole or casework. The school prides itself on its Christian faith-based approach to criminal justice topics. Students can choose from general, homeland security and management of law enforcement tracks to better customize their career path. Southern Oregon University offers both traditional and online learning environments within the criminal justice and criminology degree program. Programs and internships within local law enforcement agencies complement the curriculum to provide practical experience opportunities. The campus offers dedicated career search preparation, by replicating skills assessments often utilized within the criminal justice hiring process. The Criminology Club allows students to collaborate with other students in the program while remaining apprised of industry news, policies, and opportunities, while the yearly field trip to the Pelican Bay maximum security prison provides informative experience with prison operations. Those interested in a career in corrections, law enforcement, security, private investigation or court positions can get at least the preliminary training they need to enter the field at criminal justice schools in Oregon. Use the tool below to compare different schools based on tuition, student population levels and more. The Oregon Department of Justice is one of the largest employers of criminal justice jobs in Oregon and often has vacancies for attorneys, law clerks, and other positions. Sheriff’s offices, prisons and law firms are also some places to start the job search. Some career paths require completing a bachelor’s degree or a special training program through the employer. Use the tool below to compare some of the most popular criminal justice careers around Oregon. Many attractive criminal justice jobs with the highest pay ranges can be found in larger cities, including Portland, Eugene and Springfield. Oregon State Courts, district courts, correctional facilities and county criminal administration offices are some good places to start the job search. Comparing salary ranges and available jobs in some of the largely populated areas around Oregon with national averages can help to find the right fit. The table below outlines the different career options in Oregon compared to national averages. The State of Oregon Employment Department lists many ongoing employment opportunities in the cities of Eugene, Portland, Springfield, Rogue River and Florence. From court security officer positions to correctional officers, many courts, law firms and correctional facilities around the state offer a range of career opportunities for qualified criminal justice professionals. This comprehensive guide serves as a master checklist of guidelines for employers and registration and licensing information. It provides all of the legal requirements employers must follow and tax information. Maintained by state government agencies, this website serves as an online portal to provide resources for those that want to start, expand and operate a business in Oregon or relocate a business in the state. This website serves as resource for business owners and regulators to keep up with Oregon’s economic growth, explore business opportunities and review information about the latest innovations across the state. The Oregon State Chamber of Commerce provides advocacy and resources for business owners in the state of Oregon. The Business Oregon Commission’s mission is to support the attraction and development of new and existing businesses. The U.S. SBA supports the expansion of small businesses by providing informational resources, continuing education and connections to business financing. This membership-based group is the Oregon chapter of the world’s largest anti-fraud organization, the Association of Certified Fraud Examiners. They provide resources for anti-fraud professionals. This part of the Department of Corrections website is designed for those interested in a career in corrections. It includes information about full-time positions in one of the institutions located throughout the state and details about corporal, captain and correctional officer positions. This website includes information about the partnership between the Oregon Department of Corrections and Wasco County to handle offenders in the county. Includes information about the most wanted list and the latest available jobs. This website is dedicated to correctional facilities in Polk County, Oregon. Includes community service information, a list of the most wanted offenders and contact information. The OJDDA was created as an advocacy group for children within Oregon’s juvenile courts. It connects officers and other personnel to providing continuing education and support. The FOPPO is a membership-based organization that provides resources for parole and probation officers in the state of Oregon. The Oregon chapter of Citizens United for Rehabilitation of Errants is a membership-based organization that seeks to reduce crime by championing effective criminal justice programs and policies. This website serves as a knowledge bank with information about specialty courts, latest publications and justice reinvestment activities throughout the state. Also includes information about upcoming events. This website promotes diversity of practices, programs and agencies across the estate. It works to ensure the needs of crime victims and offenders in Oregon’s communities are met by providing educational and training opportunities while influencing local and state policies. This website includes information about all of the judicial districts in Oregon, the Office of the State Court Administrator and job opportunities within the judicial branch. A membership-based organization, the OACA offers information and resources for court professionals, including Justice, Municipal, Tribal and State Court Staff. Members also include students, vendors, active and retired judges and other interested parties. The OJRC aims to implement criminal justice reform through integrative advocacy. Their goal is to improve legal representation and civil rights for underserved communities, including people living in poverty and people of color. This membership-based non-profit provides support and advocacy for mediation and dispute resolution in the state of Oregon. The Oregon chapter of the national CASA group, this organization advocates for child welfare in the court system, with the goal of providing every child with a safe, permanent home after being neglected or abused. This website is designed for those that need legal counsel and also serve Oregon residents with justice services. Visitors can explore some of the latest career opportunities for attorneys, law clerks, and other legal positions. This website includes information about licensing and compliance, resources of the general public and information for lawyers. Also includes volunteer opportunities for those looking for work experience and membership information about the State Bar. This website provides legal services and legal aid for low-income residents. It’s designed to help people resolve legal issues and find the legal help they need in distressing situations. The OPA provides resources and connections for members of its statewide paralegal organization. A directory of statewide and county bar associations, this webpage connects legal professionals with colleagues in their area. This is a statewide non-profit group that gives low-income and elderly clients access to legal help and representation. Oregon Association of Licensed Investigators, Inc. This membership-based organization provides continuing education resources for licensed private investigators in Oregon. The police bureau in Portland is dedicated to serve area residents through its behavioral health unit, bike theft task force, canine unit, homicide unit and detective division. This website includes the latest job opportunities for qualified candidates. This website provides information about its investigative and protective services training. It offers a unique approach to train law enforcement, military and private citizens. The OSSA offers membership-based networking opportunities for state sheriffs as well as representation, advocacy and informational resources. The membership-based OSPOA represents state officers by creating a platform to discuss public safety issues with each other and the public. It also provides educational resources and seeks to improve law enforcement methods and procedures. The OACP is a membership-based advocacy group that supports the improvement of law enforcement programs and provides resources to Oregon police chiefs. The OPOA supports peace officers with membership-based resources and programs to improve training and law enforcement processes. This website includes information about environmental quality, compliance, and enforcement practices. Job opportunities with this organization are listed separately on the State of Oregon website. This website includes information about licenses, fishing resources, controlled hunts and the latest employment opportunities. This organization is committed to protecting residents’ health and ensuring all residents have access to clean air, water, sustainable food, and an unpolluted landscape. The website also lists the latest job opportunities.